Blogging is an important marketing tool, because it adds a human face to your business. It’s relatively inexpensive to start a blog, and the positive implications are endless. For a small business especially, blogging is a strategic tool that can increase customer traffic and create solid sales leads. Simply put, blogging increases SEO. Search engines love unique content, and they rank frequently updated web pages higher. The more you update your blog, the more content search engines will have to index. This means higher rankings, more site traffic and ultimately, increased brand awareness. It’s important you update your blog consistently. Ideally, you should update at least once a month. However, it’s quality over quantity when it comes to blogging. Stray away from posting content that lacks clear information and reads like a sales pitch. Fresh, quality content captivates your audience and solidifies a loyal brand following. Blogging on a regular basis builds trust in your audience, so don’t skip over this important strategic marketing tool. You’re an expert in your SMB, so use your unique industry knowledge and perspective to your advantage. 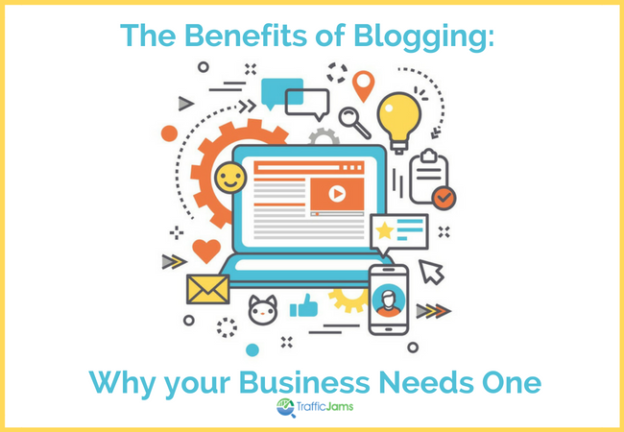 Blogging provides an informal yet effective way to communicate with your target audience and increase long-term ROI. Additionally, it differentiates you from your competitors, so your business emerges as an industry leader. Once you decide to blog, you also decide your company’s tone of voice. Typically, corporate blogs are written in first person, which creates a more personal connection between the customer who’s reading the blog, and the company who’s writing the blog. Finally, blogging creates an opportunity for readers to share your content on social media such as Facebook or LinkedIn. Each new blog post enables your audience to interact with your brand online, where they can share, message or email your post, generating valuable word of mouth. Crafting original content that sparks positive reactions creates strong connections between you and your customers. Remember, blogging is just another form of storytelling, and without a blog, your business lacks an easy way to gain credibility and sustain treasured relationships. This entry was posted in Blogging on July 2, 2018 by Megan Mills. Give your marketing some gas. Sign up for tips, latest news and more today! © Copyright . Designed by Traffic Jams. Partnered with Stratosphere Networks.